Police officers of some type may have been around since the very beginning of modern human cultures. In Ancient China, for example, the enforcement of laws was carried out by people who were called “prefects.” This structure was maintained in the region for thousands of years, with “sub-prefects” helping to enforce laws at the local level. Korea and Japan adopted this structure as their societies developed as well. In Ancient Greece, the magistrates used slaves who were publicly owned as police officers. Their duties included making arrests, handling prisoners, and investigating crimes committed – similar to what a modern police officer is asked to do. For what we consider “modern” policing, efforts were started in the late 17th century in Paris to create a police force that would ensure people had access to the “peace and quiet” they deserved. By 1709, 44 police commissioners had been hired, with the city divided into 16 districts to make it easier to manage neighborhoods. In 1699, the structure created for Paris was distributed throughout the rest of France. What is unique about this profession is that the advantages and disadvantages of being a police officer haven’t changed much in all that time. Although laws change and expectations shift, these critical points always seem to form the foundation of whether or not someone believes in their personal ability to protect and serve. 1. The relationships built by police officers are some of the strongest known. When you become a police officer, you are joining a fraternal family that is 800,000 strong in the United States, with millions more around the world. When you are called into action while serving, or just dealing with a personal crisis of some type, your fellow officers are going to be there for you. There is great comfort in knowing that if the worst-case scenario happens, there will be shoulders for you to lean on to help you make it through. 2. Police officers get to shape their communities. There will always be a few “bad apples” in the police community which some in the general public will complain about. From a law enforcement standpoint, look for the helpers. Find the people who love the work they do and put in the extra hours that prove it. Most police officers go the extra mile for the people they serve, whether they are on-duty or not. They volunteer to make a difference, speak to scouting groups, make school presentations, and create a community which everyone can take pride in each day. 3. Job satisfaction rates are high for police officers. The diversity of the work available to a police officer is extremely dynamic. No two days are exactly the same in this line of work. You never know where dispatch is going to send you or what to expect when you get there. No matter what you’re doing, however, you’re also helping people in some way. You’re working on your own, with partners, and in a team environment all at the same time in many jurisdictions. This unique combination creates a line of work that is often described as being “very fulfilling. 4. You get to work in an environment that is highly competitive. Even if you get into police work as a person who isn’t competitive, the environments of law enforcement will often change that perspective. Many police departments thrive on the competition of officers pushing on another to become better at what they do. That might be through performance standards, talent application, or skill-based activities. People who get into law enforcement are naturally ambitious because each officer wants to help themselves, their families, and their community to the best of their ability. 5. It is a career where you are always active in some way. Police officers must maintain a healthy lifestyle to be effective at what they do. That includes being mentally active in addition to the physical requirements asked of each person. You’ll find officers often pursue active hobbies, such as hiking, hunting, fishing, and boating because this helps them maintain that healthy lifestyle. Many officers are part of community teams or events, such as playing softball or serving on the board of a charity. This life structure helps each person stay strong mentally and physically. 6. There can be a lot of perks available to police officers. The job benefits of being a police officer are quite valuable in many communities – and we’re not talking about the free coffee that local businesses might offer. Many jurisdictions offer their officers a free gym membership to help them stay fit. Some communities offer home buying assistance for police officers because their presence in a neighborhood helps others feel safe. There are shift differentials, tuition assistance, educational assistance, scholarship programs, paid community service time, along with the typical job benefits one would receive at any job available too. 7. Many police officers have the option to retire early. If you’ve seen movies about police officers produced by Hollywood, then you might be familiar with the term “putting in 20.” Many jurisdictions allow police officers to retire early, after 20 years of service, with a full pension. If you got started in your career at age 21, then you could potentially retire in your 40s and pursue something else you love without worrying about a paycheck. In California, if you have a minimum of 5 years of service on the job, then you are eligible to retire to collect a partial pension at age 50. 8. It is a career opportunity which offers growth potential. 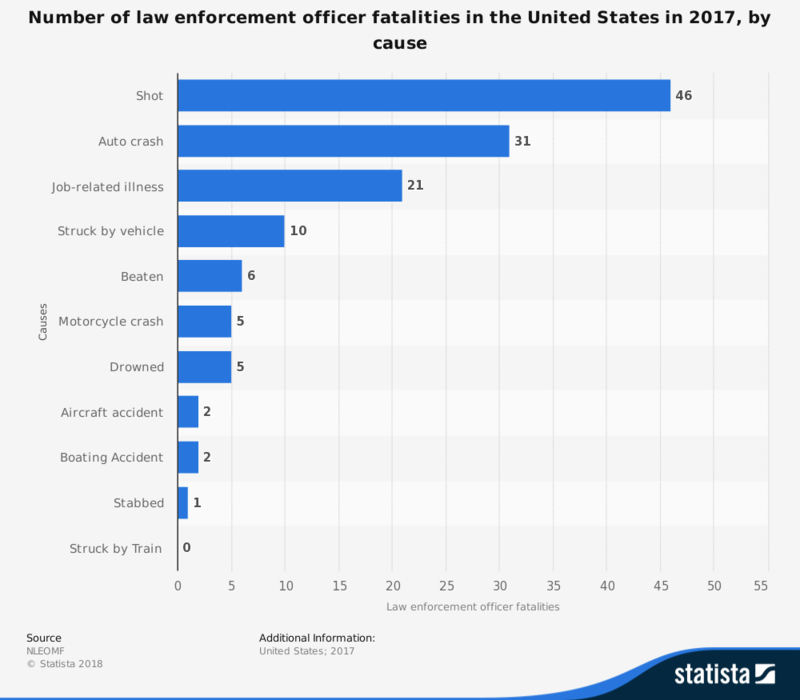 Through 2028, the Bureau of Labor Statistics estimates that an additional 46,000 police officers will be required to meet community needs in the United States. That represents a 7% increase in the number of available positions. Most departments don’t experience a lot of turnover, but it is possible to become enrolled in police academies or training institutes to prepare for this career option. Even if you don’t have a college degree, the average pay for a police officer in the U.S. is over $62,000. 9. Police officers are always recognized for their hard work. Many people feel like their work goes unrecognized every day. With police officers, that is not usually the case. You’re going to be tapped for positions which have increased responsibilities if you’re good at what you do, ranging from sergeant to police chief. Awards are conveyed at the local, state, national, and global levels when you do exemplary work. Everything from victim advocacy to crime prevention is recognized in this profession, which makes it easier to do the hard work that is asked of you each day. 1. It is a job where you’re faced with human misery every day. Law enforcement officials often see the divisiveness of communities at a personal level every day. They are asked to respond to situations where people are experiencing one of their worst days. At the same time, they are also tasked with providing safety and security to their jurisdiction. They see this conflict on an almost daily basis, then are asked to write you a speeding ticket if you break the law. All of that comes together to create people who are often cynical as their first reaction. 2. There are extreme stressors present in the position every day. Police officers are often working long shifts after not getting a chance to rest properly the night before. Their work often leads to social or societal isolation because they’re “always a cop,” even when not on duty. Whether they’re on patrol or doing paperwork in the office, it would be fair to say that there is always a constant threat of danger to worry about. Add that to the constant exposure to the negative elements of humanity, and you’ll find many officers dealing with stress every day. 3. Every police officer faces the risk of injury and death every day. In 2017, there were 128 police officers killed in the line of duty in the United States. 44 of those officers were shot and killed. Those figures were about 10% lower than the year before, and the second-lowest total in 50 years, but it is still far too many lives lost to protect communities from violence and crime. Texas led the country with 14 fatalities, while Florida and New York at 9 each. Whether you work in a gated community, a small town, or a large city like Los Angeles, there is always the threat of injury or death facing a police officer. 4. Many police officers are frustrated with their job. According to information released by the Pew Research Center, over 50% of police officers in the United States describe their job as being “frustrating.” Another term is used there as well: “unfulfilling.” That is almost double the national average in the United States for people who are discontent with their jobs. Many officers find themselves in a position where they’re asked to work harder and longer because their community is cutting a budget or chronically understaffed. 5. PTSD is a common issue found in the world of law enforcement. Some police officers have made it through their entire career without needing to pull their service weapon. Others are not that lucky. Working as a police officer means you’re exposed to events that may be frightening. You may see violent acts, things that shock you, deceased victims, fatal accidents, and horrendous things that go far beyond what the average person is exposed to each day. The International Journal of Emergency Mental Health has published research that shows police officers are more likely to experience sleep disturbances, anxiety, alcohol abuse, and PTSD at rates higher than the general population. 6. Police officers are forced to deal with many stereotypes. Although times are changing in TV shows and movies, police officers are often portrayed as people who eat a lot of doughnuts, like to thump heads, and tend to have the intelligence comparable to a rhesus monkey. These stereotypes influence how many people see the police officers in their community, which can lead to misunderstandings about who they are as people. Even when an officer breaks the law, most are still compassionate, caring, and smart individuals who want to make a positive impact on their community. 7. It is a profession that is always under much scrutiny. Anything a police officer does, whether on-duty or not, becomes the subject of community complaints and internal investigations. The average citizen is more likely to call the employer of a police officer if a dispute arises than any other profession. That means you’re never really off-the-clock when you work in this profession. These advantages and disadvantages of being a police officer shed insight into what it takes to serve a community every day. The work is challenging, with long hours and dangerous situations to manage. There are also great rewards because this job helps a community stay safe as no other position can. Not everyone can be a police officer, but everyone can support their local law enforcement officials in some way.